Now apply for SBI basic (BSBD) and small zero balance saving account online. Fill your account opening form and submit to branch with all necessary documents. SBI online account opening facility enables you open saving account. Bank has launched an online account opening platform, so just fill your details and submit your application online. If you want to apply normal saving account then use SBI YONO and open your account online instantly. Here we will tell you how to apply SBI Basic and small saving account online. Fill online form and submit your details. 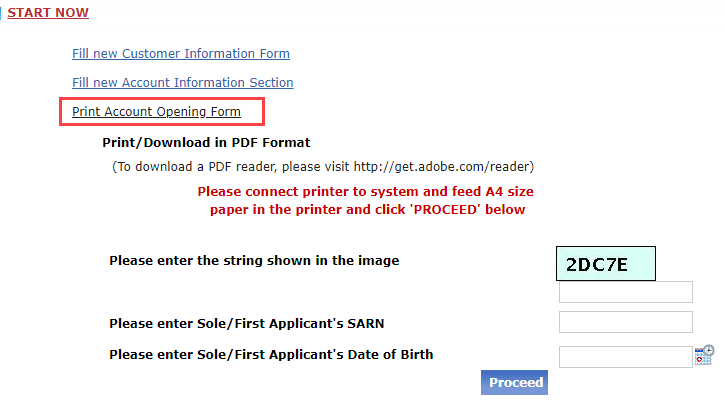 Print the Account Opening Form (AOF). Attach ID proof, Address proof and passport size photo with form. An SCRN (Small Customer Reference Number) will be generated, which please note down. SCRN will also be sent on the registered mobile number of the applicant(s). 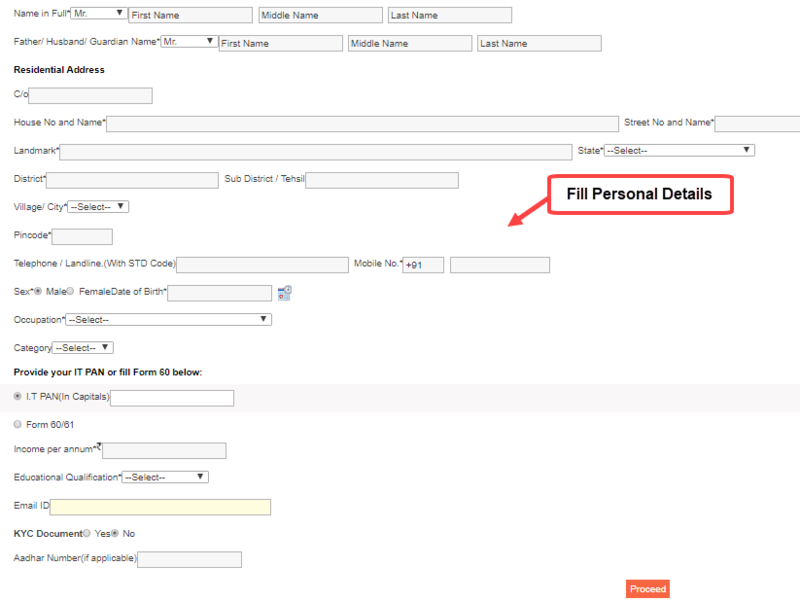 (2) In personal information, fill your personal information like name, address, birthdate, gender, mobile number, email address, and Pan number. Enter your Aadhaar number for KYC document. After filling all necessary details, click on proceed. After filling all personal details and click on proceed, SCRN (Small Customer Reference No) will be generated, note this number and click on save & proceed. It will be asked “Do you want to add another applicant” click on no and proceed. (3) The next form is account related information. First, enter SCRN number and mobile number. 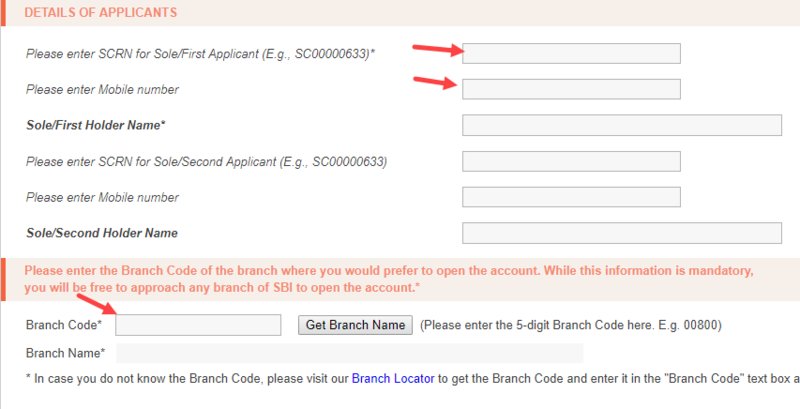 Select your branch, enter branch code and click on Get Branch Name. You can use branch locator option to find your nearest branch. 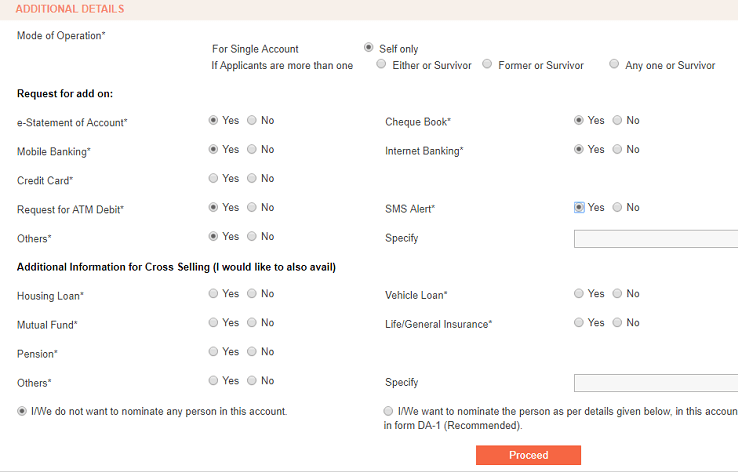 And in additional details, select mobile banking, net banking, ATM card, and other services (yes or no). Now click on proceed. And now your SARN (Small Account Reference No.) will generate, note this number and click on save & proceed. Done your account opening form submitted successfully. And now you need to download your filled account opening form and take print out. To download your filled form, just click on Start now and then click on Print Account Opening Form. Enter your SARN number and Date of Birth and click on proceed. The form will be downloaded in PDF format. Take print out and attach necessary documents and passport size photo. Now visit your selected branch and submit your form. Your Account will be opened instantly. So this is how to apply for SBI small and Basic saving account online. For the normal saving account, you can apply through SBI Yono.